Wow! No kidding, the idea of heading out to the beach in a van pulling a trailer seems....well it seems like that picture about sums it up. A number of years ago I was at the south Oregon coast and watched the same thing happen to relatively new Cadillac Escalade. Somebody had gone out there with those low profile street tires and the rest was history. Same story with other photos in the Surf Van post. Hard to believe that is a van in the last photo. I wonder if they pulled it apart when they tried to tow it out while it was buried in the sand? I once saw a brand new Land Rover stuck in the sand at Bolinas (California coast) They had a winch cable tied to the bulkhead, but ran out of battery power as the tide was coming in. As the sun was setting, it was being smashed against the bulkhead, and in the morning it was a total wreck with all the windows blown out, tires flat, and about a foot of sand inside. It was quite sad. Ouch. Mother Nature does not play. 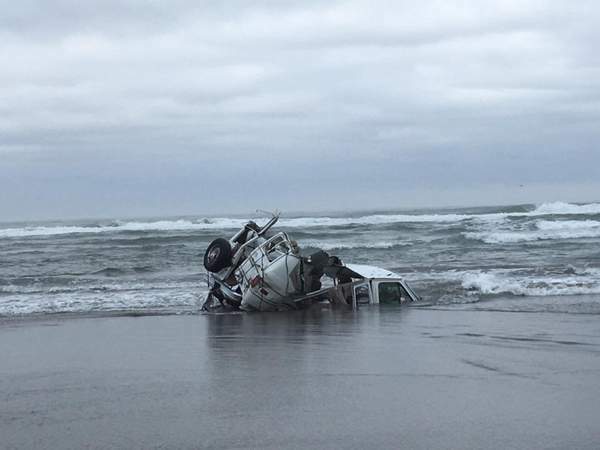 It's pretty easy to get your self in that situation, the hard packed sand adjacent to the surf can be a lot easier to drive on and tow over than the inner beach, at least, until it isn't. A similar thing happened to a couple of knucklehead friends of mine in the early 1980's, with their 4x4 trucks, near Halfmoon Bay CA. There *may* have been underage drinking involved, so keep it on the DL... In their case, both trucks were junk by the time the tide went back out and the tow trucks showed up. Tough lesson. You've got to know your tides, and the tidal change in feet, in the area you are playing in, if you're going to drive close to the surf.Talk to people who live closer to the equator, ask for a tide chart, and they look at you like you've just asked for a 5 pound sack of horse feathers. Any semi-intelligent boater in the SF Bay or Delta, wouldn't launch a small skif wo/first checking the tides for the day. Driving on beaches is wrong. Never have figured out why people drive on beaches and why it is even allowed.